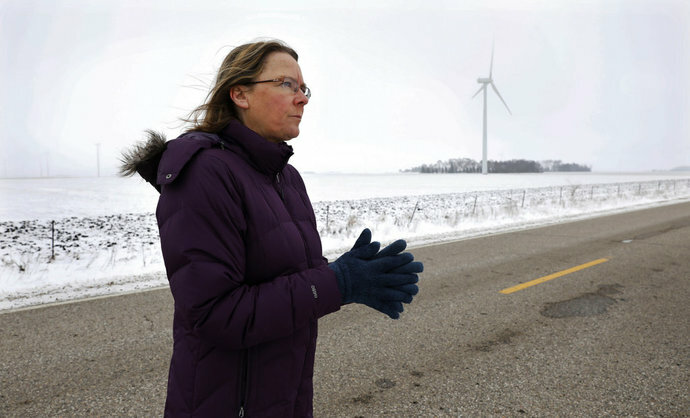 filed: February 21, 2018 • Minnesota, U.S.
Wind turbines have become as commonplace in parts of the rural Midwest as tree-sheltered farmhouses, gray-metal grain bins and deeply furrowed fields. The slowly spinning blades are a sign of investment in a region that often has few growth opportunities to brag about. Wind power remains broadly popular, drawing support from environmentalists who worry about global warming, landowners who welcome a new stream of steady income and local governments seeking more tax revenue. For supporters, wind seems to offer something for everyone: carbon-free electricity, construction and maintenance jobs, and competitive utility rates. Those factors have fueled incredible growth in the industry, which the American Wind Energy Association says operates more than 54,000 turbines in 41 states, Guam and Puerto Rico. The amount of electricity generated by wind has grown more than fivefold from a decade ago. The wind industry says there are no independent studies proving the turbines cause health problems. And in many cases, they argue, wind farms boost property values because developers pay to upgrade surrounding roads, and tax revenue generated by the industry offsets property taxes for homeowners. Some wind supporters believe that fossil-fuel industries help fund organizations that oppose wind developments. Studies and claims by those groups then can motivate grassroots groups, said David Anderson, a policy manager with the New Hampshire-based Energy and Policy Institute, which supports renewable energy options. 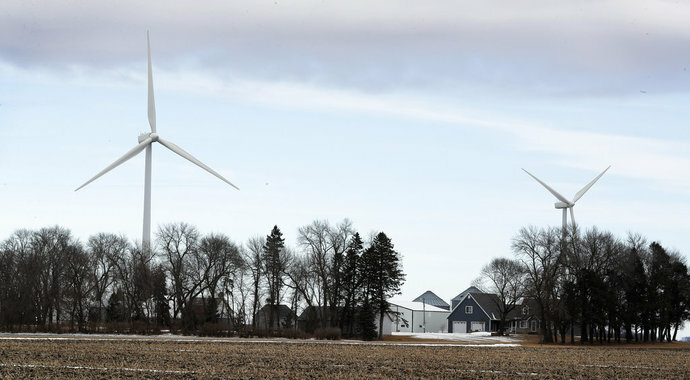 Other than people who would earn money from leasing their land for the turbines, nearly everyone opposed the plan, said David Brouwer, who has lived for nearly 30 years outside Sioux Falls. It’s been nearly seven months since the vote that decided the matter, and hard feelings still linger among those on opposing sides of the issue, he said. In Maine, plans to erect turbines atop ridges have outraged people worried about marring the rugged landscape and hurting tourism. The group Friends of Maine’s Mountains has been fighting wind-energy developments in the state Legislature, before regulatory panels and in the courts. It has managed to slow or stop nearly all of the proposals. Group spokesman Christopher O’Neil said he knows wind farms remain popular with many people in distant, more populated areas near Portland or elsewhere in New England. “Lots of folks in Portland in their BMWs and fine dining restaurants are OK knowing those country bumpkins are getting those wonderful wind turbines so we can have a clean, green conscience,” O’Neil said. Tim Hemphill, who grows corn and soybeans on 160 acres in northwest Iowa, appreciates the nearly $30,000 he earns annually from two turbines on his land, especially when crop prices are low. He used to live near the towers until he began turning more farming duties over to his son. The opposition also frustrates Gregg Townsend, the auditor in Tipton County, Indiana, who said activists would “gin up anger and frustration” in many counties. 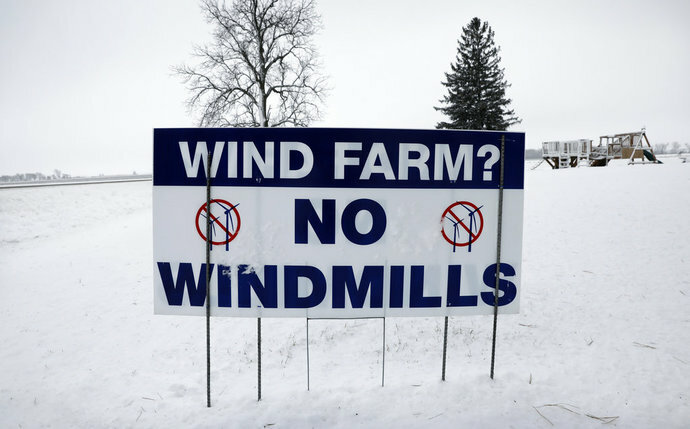 He blames them for stopping wind projects in Tipton and at least six other Indiana counties. “They’ll buy matching T-shirts and organize a group, then flash mob the commissions or zoning boards of appeals,” Townsend said. Local officials become intimidated and end up rejecting projects despite the desperate need for tax revenue, he said.